MS/HS Teachers and Admin are invited to try out coding and integrate it into classes during the week of 5-9 December. Hour of Code was started by Code.org to encourage schools to include computer programming and computational thinking throughout the curriculum. This year they have added many new resources for a wide variety of abilities and interests. Computer Science is Changing Everything! A variety of activities and resources will be available and on display in the student lounge throughout the week. We are also coordinating visits by representatives from Microsoft, Yandex, and Google, who will be talking with students and demonstrating coding applications. Feel free to stop by the student lounge and in 2069(MS Lab) with a class to join in. Better yet, try to integrate some code into your class during this week. Below are some suggested websites with a variety of ways to get started. Check them out! And definitely contact Devin or Paul for support. We’re happy to help. Saying “Goodbye” to people and places and packing up to move can be difficult and messy, but hopefully you will have some great celebrations and moments of closure before you leave. The steps below are meant to help you spend as little time as possible sorting and packing up your AAS digital life so that you can be sure to leave important work here and take it with you as well. If you have files on the AAS server or on the hard drive of an AAS desktop computer, you can attach an external hard drive or upload files to a cloud-based account. 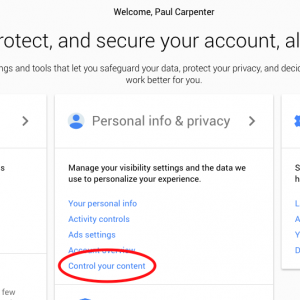 Other than the Outlook portion just below, the bulk of this post is aimed at helping those who have principally used Google Drive for storage. Since many of us use Outlook email regularly to receive and send attachments, you might want to review your message to look for anything you want to keep. The quickest way to review ONLY THOSE MESSAGES WITH ATTACHMENTS is to type HasAttachment:yes into the Search Mail and People field. You can learn more search shortcuts here. Notice that you might want to click Get more results at the bottom of the list to see further into your message history. You can either forward messages to your personal email account, or if you have one at another school, send it there. Or you could also download the attachments and put them on a portable drive or upload into cloud storage to keep them. My Drive – If you are like me, you probably have some organized files/folders and others that are more scattered. So your first step to prepare to leave and move things is to get organized. Send unimportant stuff to the trash and sort key documents into folders. If you have been working in shared folders with department members or other colleagues, put everything in the logical place where it should remain. If you have files that are in many shared folders, jump down to Option 2 below. To see all files/folders owned by you, type owner:me in the search bar at the top of Drive. Shared with me – I sometimes hear people ask about cleaning up/deleting files/folders that they see in the Shared with me view. My response is always to simply LEAVE IT ALONE. There is no reason to try to organize or control this flow. From here you can add items to your own Drive if you need/want them. But otherwise Shared with me should be treated like a river that flows below as you view it from the shore or from a bridge above. Or maybe a sushi conveyor belt where you grab those things that you want. Controlling the river’s flow or eating all the sushi are impossible prospects, so just let things flow past. If you wish to simply download all of your Google Drive files/folders in one go so that you can put them onto a hard drive or upload them somewhere else, first put all of them into one folder. Name it “AAS To Go” or something similar. Then right click(Windows) or control-click(Mac) and choose Download. This will save the folder and all its contents in a .zip format. This compressed folder will take up less storage and can be expanded again once you are ready to open and organize the files/folders elsewhere. If you have lots of files and folders in many locations that will be tedious to organize, Google Takeout can be a better choice. This is also a better method for anyone who wants to download data from other Google Apps you have used at AAS, such as Chrome bookmarks, Blogger posts, Maps data, Google Photos images, and even YouTube videos. 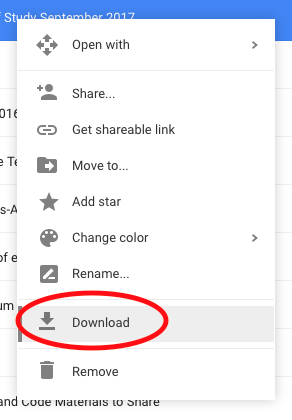 To use Takeout, click on your image or initials in the circle at the top right corner of the Google Drive or Google Search window. Then click on My Account. 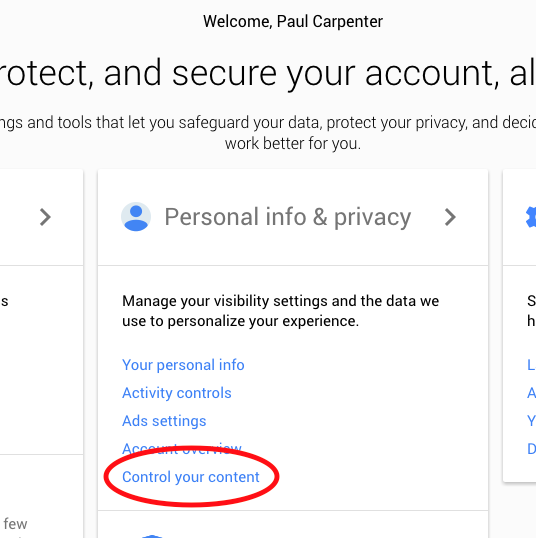 On the next page, click on Control your content. Then click on CREATE ARCHIVE. have a link emailed to yourself, open it on your own device, and download everything there. all data placed in your AAS Drive to download onto your own device, save on an external hard drive, or move it over to your own cloud storage. send it to Dropbox or OneDrive if you already use those services personally or professionally. One other option that is very useful if you are moving to another school that uses Google Drive is a tool called Drive Migrator. With this, you will prepare folders in your AAS Drive, and then it will create a copy in your new Drive. You must have the new account and password. This video will help. Lastly, before you go, you need to transfer ownership of all key curricular files/folders so that they will not disappear when your @aas.ru accounts are disabled. When you are fully prepared to transfer ownership, put everything to transfer into one folder. Name it something recognizable with a curricular label, e.g. G7 Humanities. 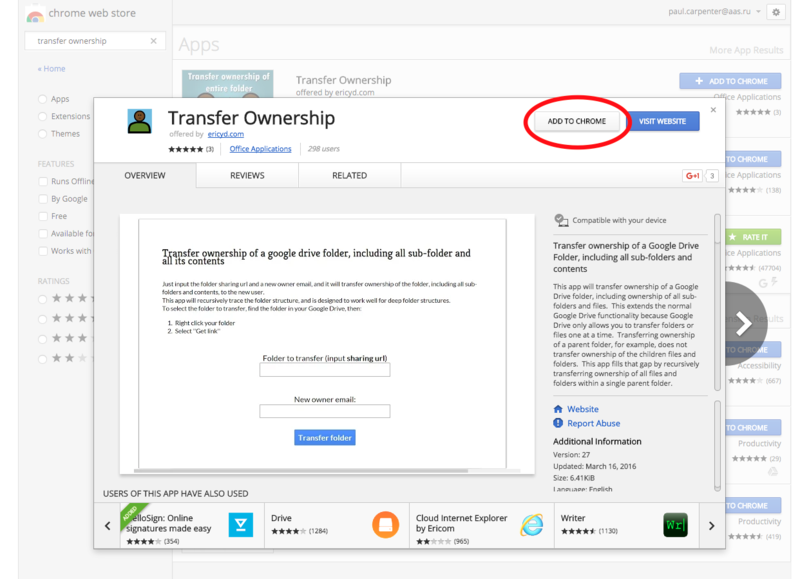 Then you can use a Chrome tool to transfer ownership of that one folder and everything within it. You must use Chrome. Click here to get Transfer Ownership. Then select the folder you prepared, enter the email of the new owner — either an @aas.ru colleague or an AAS GAFE account (gafe.curriculumfiles@aas.ru for teachers), and hit Transfer folder. You will no longer be the owner of these files/folders but will continue to be an editor until your account is disabled. We’ll miss you and wish you all the best in your future endeavors! Because we are often moving around classrooms, traveling throughout the building, or maybe even working from home, having access to our AAS email, calendar, and files on the go is often handy, perhaps even essential. Most of us have some kind of mail app set up to get our school mail on mobile phones and/or iPads/tablets, and this might be working well for you. But if you aren’t already using it, today I’m suggesting that you take a look at the Outlook app because it offers a few helpful possibilities that you might not yet know about. 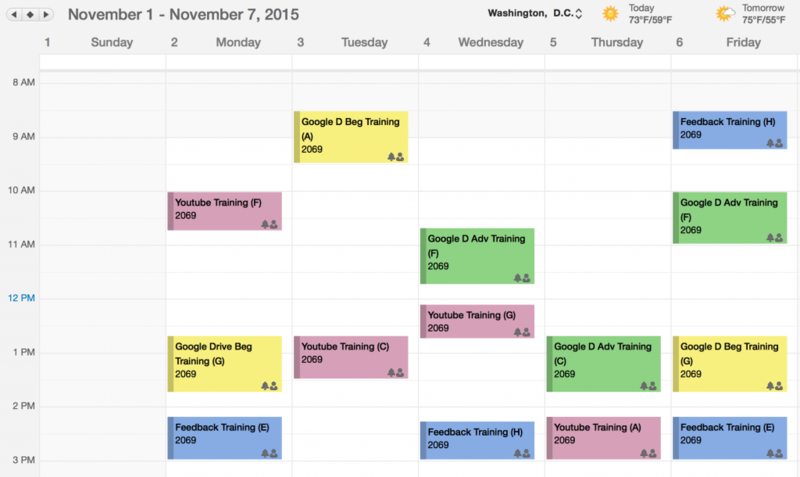 Email/Calendar/Files/People all in one place! On my iPhone, I once used the Mail app, and I liked the swipe to delete and the automatic connections with the Calendar and Contacts apps. However, I had to open/close these apps to maneuver back and forth between them. In Outlook, all of these functions are tied into the same app. In the iOS(iPhone) view particularly, you can simply tab between them at the bottom of the screen. Email messages in Outlook are sorted into 2 streams — Focused(generally all messages from @aas.ru addresses) and Other(messages from external addresses, and therefore probably not pressing items), which makes it easier to stay focused on the people you need to collaborate with and respond to more regularly. The Files section gives you quick access to the documents that people have shared through attachments. The Calendar integration is particularly convenient. When you receive a calendar invitation, you can RSVP from within the email. And when you need to propose meeting times with others, you can very easily send some options for when you are available — all without leaving this app. Additionally, you can set the swipe left and swipe right to Archive, Mark as Read, Delete, Schedule(to arrive again later), Move(to a folder), or Flag messages. Your mail folders and rules and other various settings from Outlook on the desktop or laptop also carry over. We can easily get overwhelmed with messages and information, so I generally like to keep my AAS email, calendar, etc. separate from my personal stuff. 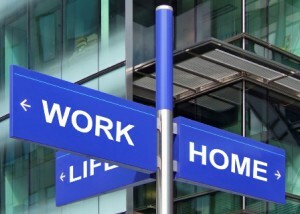 By using this separate app only for work, I am better able to make a clean break if I am not working at night or when I need to focus on other things. My mail and my calendars are not overlapping and are not competing for my attention. You can read/learn more here and get links to the Apple Apps Store, Google Play, and a Windows phone download. In Settings touch Add Account and choose Exchange. 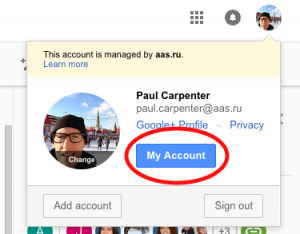 Your Email Address here is lastnamefi@aas.ru(lastnamefirstinitial), e. g. carpenterp@aas.ru, and your password is your regular school mail password. If you need to enter these, the Server is owa.aas.ru and your Username is lastnamefi, e. g. carpenterp. ****Nerdy sidenote – some of you might use Sunrise, the popular calendar app from Microsoft. It is being integrated into Outlook and will be abandon at some later date. Coding, aka computer programming, is increasingly recognized as a vital skill for students to acquire. College/University grads with coding ability find more success in the job market. And it is a substantial element of our effort to ensure that students are not simply consumers of products/knowledge/tech; they should be PRODUCERS! So for the last handful of years, code.org and many others have promoted hour of code events to expose students and teachers to the possibilities of learning computer languages. During our week of code, look for posters with QR codes linking to a variety of coding activities, games, and tutorials for all ages and levels of experience. On Thursday, a CODE ZONE will be set up in the student lounge/hall of flags. Large screens will allow students or teachers to connect, try it out, and show everyone their learning and skills. Devin and Paul will be there with classes and as helpers throughout the day. You can stop by on your own, send students who are finished with other work, or bring your entire class. Most of these sites require either no login at all or can be connected easily via school Google accounts. Please join us to help reach the goal of everyone at AAS participating in at least one HOUR OF CODE this week!!! Next week we’re excited to offer two interesting tech topics that can be used in any classroom! Each session is available multiple times in the MS Lab; you should be able to find a time that works in your schedule. If not, feel free to set up a 1:1 time with us. Learning Snapshots – Use various techs like Socrative, Exit Ticket add-on, student blog posting with pictures/screenshots of paper assignments to take a learning snapshot or formative assessment. Also try the idea of Backchannel chatting to keep a live chat that accompanies class discussion, Today’s Meet, Chatzy, Twitter, and Ning. Video Quizzes- Embed questions into YouTube, Vimeo or other videos to create a lesson and assessment in one tool. 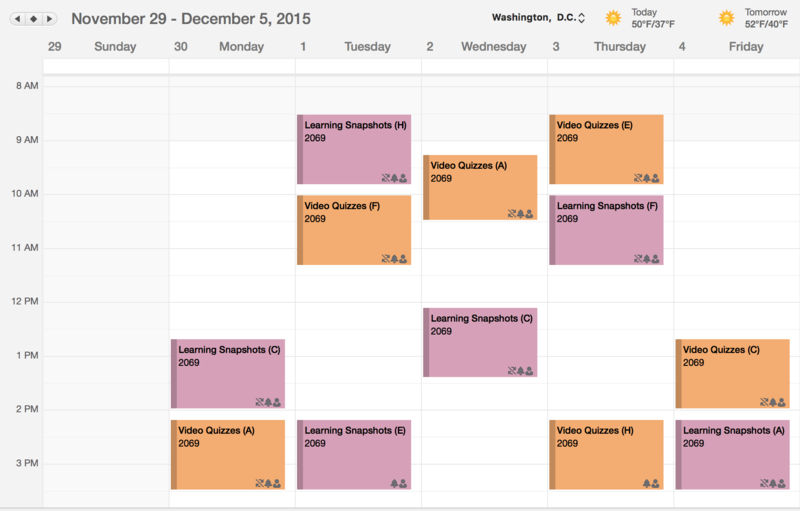 Great for flipped classroom approach: Educanon, Zaption, Vialogues, HapYak, and more. Remember, the schedule lists the Block next to the title. Recently, a number of people have asked for help with opening, viewing, and editing .pdf documents, so here is your solution. Since the beginning of the year, many of us have been frustrated when we click to open a .pdf on a school computer when suddenly it completely takes over the screen surrounded with a seemingly inescapable ominous blackness. The problem here is that Windows 8 is set up with a default program called Reader, which is a .pdf reader. It allows you to read the .pdf, but that’s about it. So you will need to tell your computer to open .pdf documents with a different app, Adobe Acrobat, if you want to be able to read, edit, comment, rename, and any other function that you usually do with a .pdf. Watch this video for instructions. By the way, AAS faculty & staff can now log in to Adobe Creative Cloud and download Acrobat, Photoshop, Illustrator, Premiere, and the rest of the professional level software from Adobe. More details on that soon. If you want to get started right away, ask Paul or Devin. Of course, you should always feel free to request any sort of support for technology integration and your own learning. But this week, we want to offer specific focused sessions to help with those topics/skills that have been identified by teachers among goals for this year. Your friendly tech team–Devin & Paul–will be offering a week of training sessions when we get back from break, November 2- 6th! Each training will be offered multiple times, so find a time that works for you. Only 30 minutes! You won’t lose an entire planning block! No need to let us know you’re coming. Just show up! All sessions will be in the MS lab #2069 and laptops will be available. Feedback – Strategies for student feedback using Google Drive connected with Google Classroom. Each Training Session lists the name and block (letter) when it will be held. If you can’t make a session or would like a 1:1 session, send us an email! Enter your email address to subscribe to inTECHgration and receive notifications of new posts by email.